Just spoke with up and coming young singer Lawrence Mitchell-Matthews (Baritone), who told me of his appearance last year at the Colour of Music Festival in Charleston. 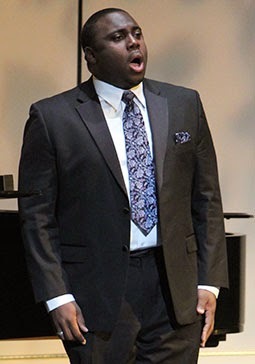 Wanted to let AfriClassical blog also know that this Detroit native and senior at Indiana University, South Bend, will be a featured soloist at Shiloh Baptist Church (Washington, DC) 2014 Handel's Messiah. This worship service will be held on Sunday, December 14, 2014, 5pm.